Let's build a fully operational battle station. The Death Star from Star Wars is huge. There has to be some kind of master architect who put together those facilities for the Stormtroopers, as well as the meeting rooms, the hangar bay and of course, the giant laser cannon that fries so many ships in Return of the Jedi. What if you could build your own? You'll get your chance soon enough. Disney Mobile announced that it teamed with NimbleBit, the developer of simulation games Pocket Planes and the recently released Pocket Trains for a new project called Tiny Death Star. 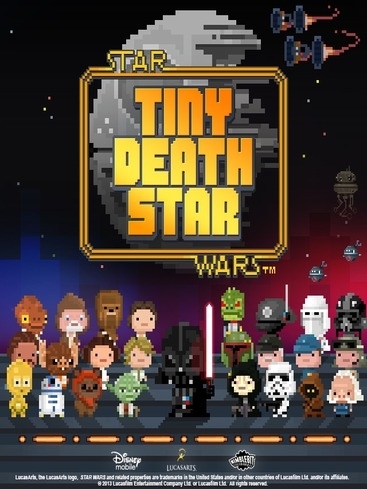 Like the Pocket games, this sim will utilize a cute 8-bit style, but feature various characters from the Star Wars universe, including Darth Vader and Yoda. You'll be able to help Vader and Emperor Palpatine put together a battle station to be proud of, while attacking Galactic Bitizens. There's no word on a release date, but the game will be available for multiple platforms worldwide. We'll have more information soon.